Sponsored by Nordstrom. Affiliate commission links are also used in this post this post about spring wedding attire ideas. Another wedding season is almost upon us! If you’re attending lots of weddings this spring and summer, you may be trying to figure out what you’d like to wear. However, if you’re the one planning a wedding or an attendant in the wedding, you may be either looking at items to wear in the wedding, or getting a few last-minute accessories! 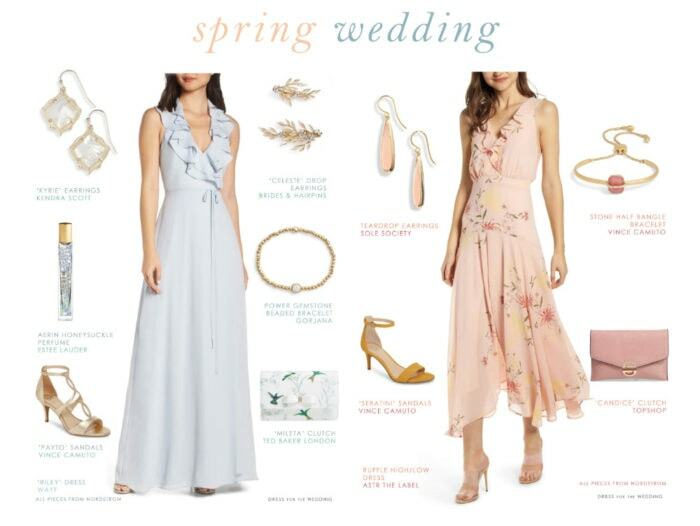 No matter which stage you might be in, Nordstrom has everything you could need for wedding attire for the spring season and beyond! 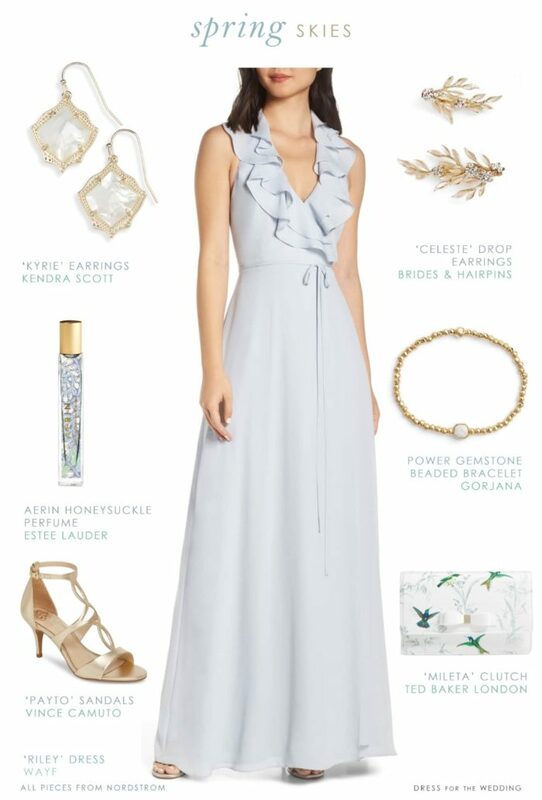 Today, I’m showing you three looks entirely from Nordstrom that can be great spring wedding guest looks, but also can be outfit inspiration for a your wedding party! Floral dresses always make a perfect spring wedding guest outfit for a daytime wedding. Spring daytime weddings call for light fabrics and pretty spring colors. This high low maxi dress has all of that, and is less than $90! The shades of pink, peach, and yellow give lots of spring colors to pick up on in the accessories. In addition to wearing this to a wedding, this could also be a beautiful style to wear to a dressy bridal shower, or spring rehearsal dinner, or even an Easter sunday style. This dress is by one of my favorite labels for dresses around or under $100. It’s ASTR the Label which also offers this $89 dollar lace midi, one of my favorite dresses for bridal showers, wedding guests, and all sorts of special occasions. It comes in several colors; so buy a few to get you through the season! This sky blue maxi dress has beautiful ruffles and a lace up back. It would make a beautiful bridesmaid dress, or maxi dress for a guest to wear to a wedding. This serene blue wrap style maxi dress is by WAYF, which is a fantastic label that offers loads of affordable boho-inspired dresses and tops. These dresses are perfect bridesmaid dresses. There are a few styles of dresses in the same fabric, and some other prints if you want a mix and match style. See the shop section below for more WAYF dresses!If this isn’t your color, you may want to check the rainbow of bridesmaid dresses from Nordstrom. One can also easily wear this dress as a wedding guest. A breezy maxi dress like this is perfect for spring weather, and is also easily dressed up for formal events, or dressed down for relaxed outdoor ceremonies. We paired it here with some dreamy accessories with hints of blue, green, and white. Spring is also a great time to try out a new scent like this AERIN Mediterranean Honeysuckle fragrance. I love the rollerball size for stowing in a purse for a scent touch up mid-day, or for giving as a gift for bridesmaids. This beautiful lavender evening gown has long sleeves and beautiful embellishment at the wrist. This gown is the perfect choice for a formal spring wedding, or a fantastic style to consider for a Mother-of-the-Bride. Mother-of-the-Bride dresses with sleeves and pastels are some of the most sought after styles! This lavender evening gown could easily be worn by a wedding guest, but since it also has sleeves and is a beautiful Mother-of-the-Bride color, I styled it with a Mother in mind. If this isn’t the right style of dress for your event, Nordstrom has so many other Mother-of-the-Bride styles. You can also use Nordstrom’s services including alteration services, wedding styling options, and beauty stylists to help make sure you get the perfect look from head-to-toe for your child’s wedding This dress is Vince Camuto, a label I love for shoes, accessories and fantastic modern formal dresses like this rose gold sequin number. Nordstrom is renowned for their customer-focused care service and high-level service offerings, that bring personalized detail and attention to your shopping and styling needs. One of the services that might be helpful to you as you prepare for wedding season are Buy Online Pick Up in Store. If you live nearby to a Nordstrom and need an item that day, you can save time by buying online, and then picking your order at the store. Nordstrom will pull all your pieces together – saving you time shopping in store, or waiting for shipping. You may also want to get glammed up for a certain event, which is a great way to make use of Nordstrom’s beauty stylists. Nordstrom carries top makeup and skin care from all sorts of leading brands like Estee Lauder, Urban Decay, and Fresh. They also offer wellness and hair products from Living Proof. Easily make an appointment with beauty styling to perfect your skin care and makeup routine before your wedding or special event. You’ll want the perfect fit for your wedding attire, and the team at Nordstrom can help with that as well! Nordstrom offers alterations which are done quickly and easily in store. You can even have alterations done to clothing you already own – it doesn’t need to be a Nordstrom item! Nordstrom also carries some top labels and exclusive brands for wedding attire, like Jenny Yoo, Lulus, LaFemme, Pisarro Nights, Dessy, Hayley Paige and more. They also have guest dresses for every dress code. If you’re the one getting married, Nordstrom’s wedding selections offer everything from your wedding dress, bridal shower outfits, shoes, accessories and undergarments. You can shop many bridesmaid dresses, accessories, and other wedding-ready dresses online. You can shop The Wedding Suite in-store locations for designer bridal gowns. For more style tips featuring Nordstrom ideas be sure to check out this post from yesterday with more spring special event outfits, including a spring suit that would be perfect for grooms and groomsmen.